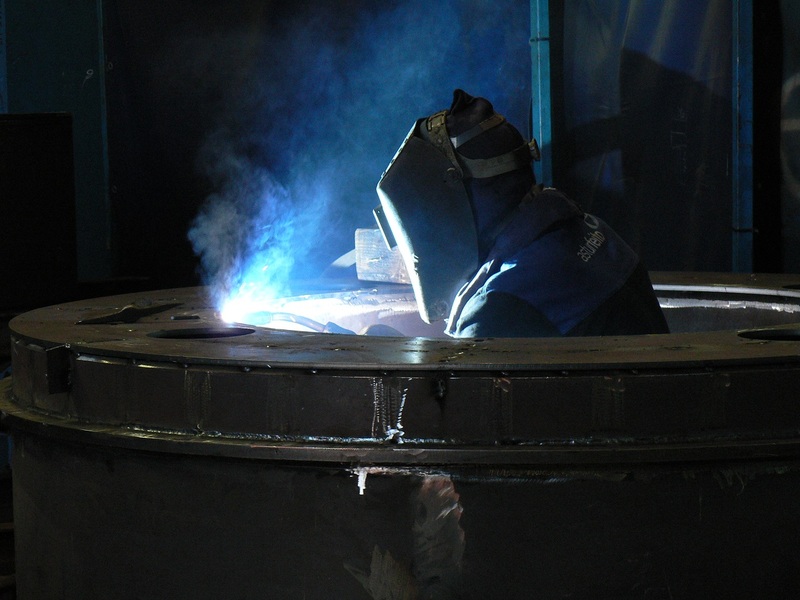 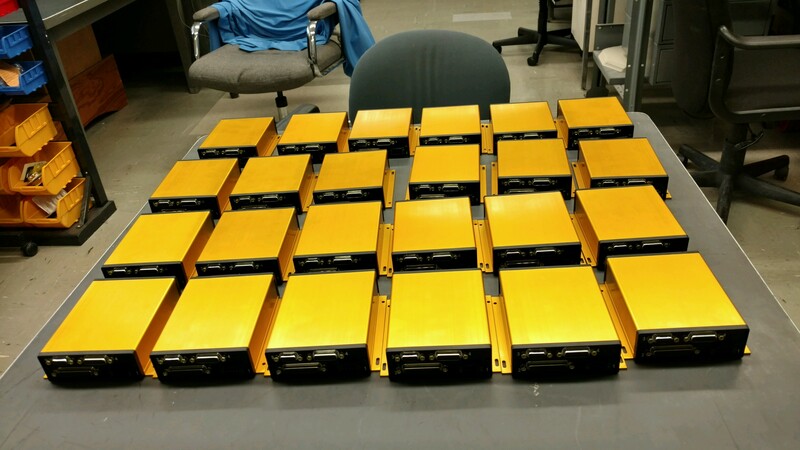 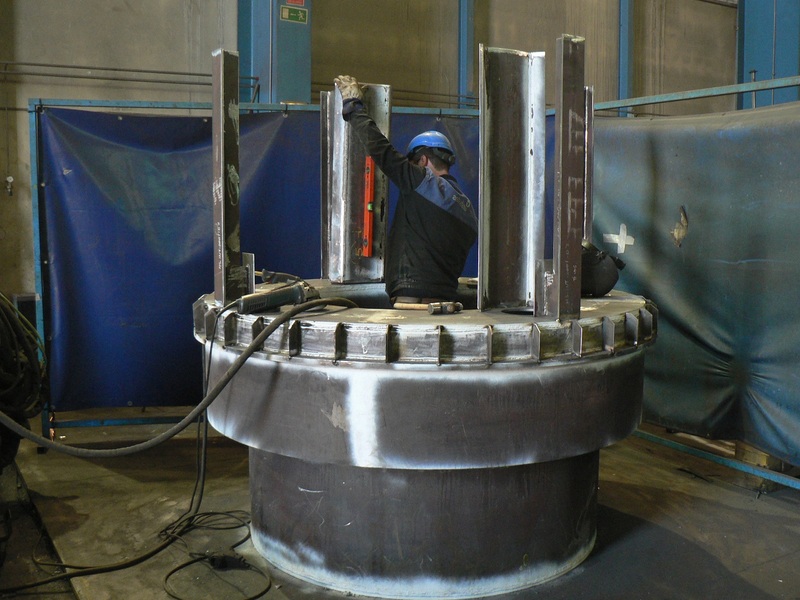 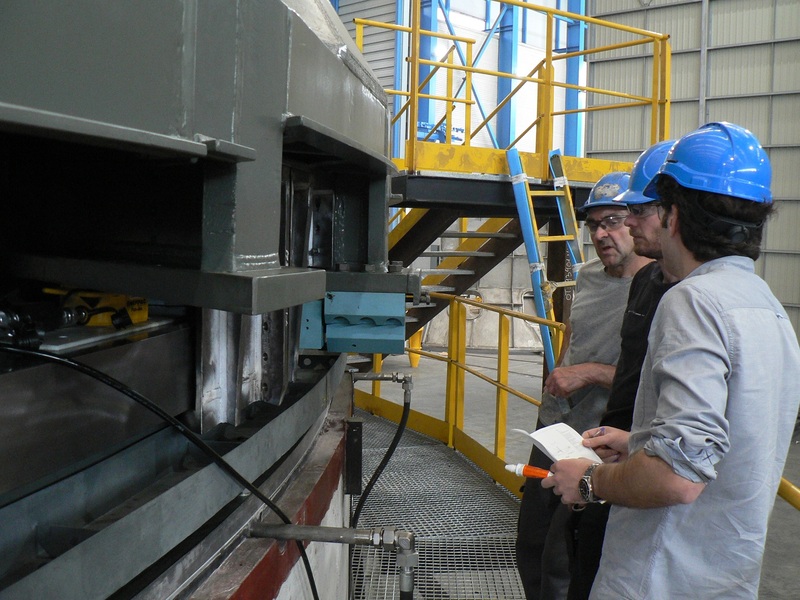 LSST ILCs – the New Gold Standard! 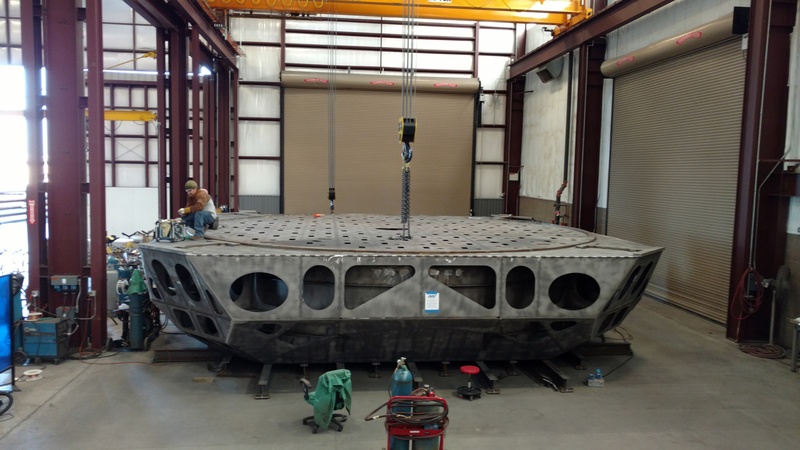 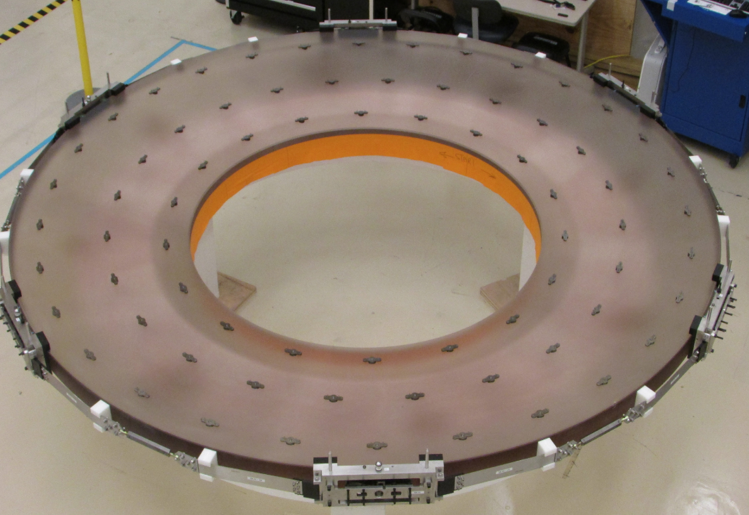 A completed deck plate manufactured by Tucson vendor CAID Industries who is building our M1 M3 mirror cell. 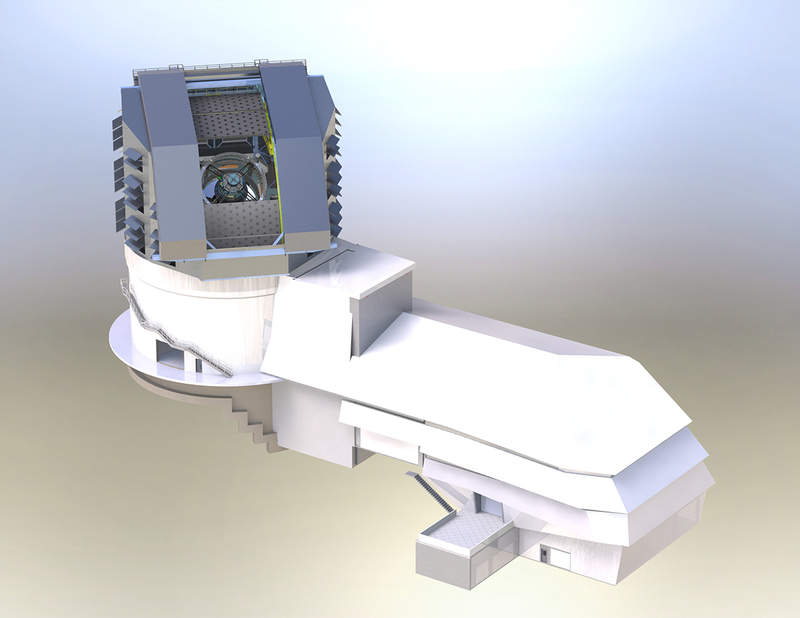 Super detailed, high resolution cut-away render of the telescope model showing the inner workings. 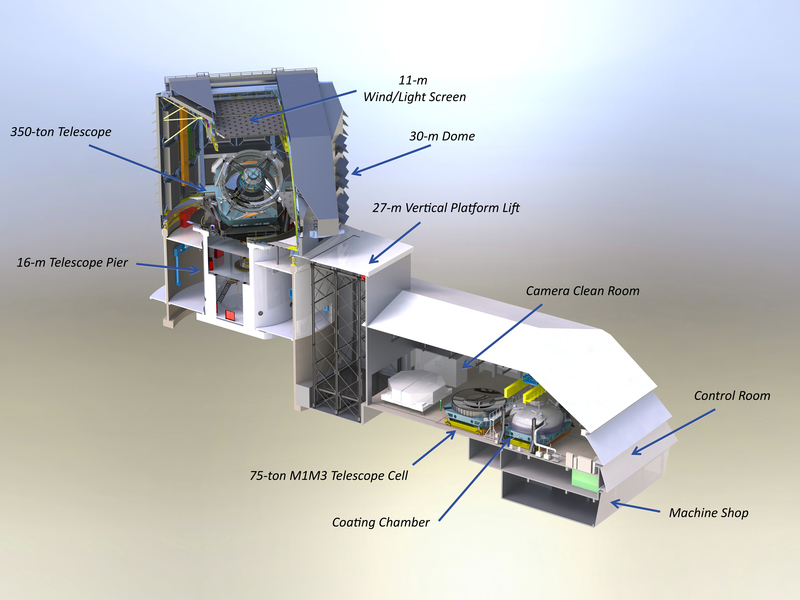 Zoom in on this one; it's worth a closer look. High resolution render of the facility model. 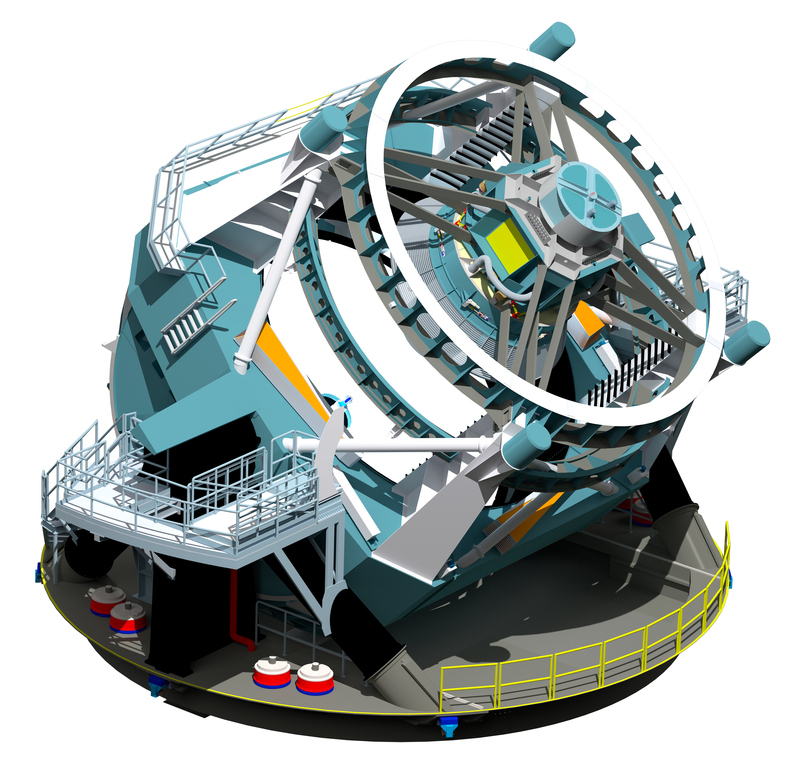 Render of the telescope model in the zenith position. 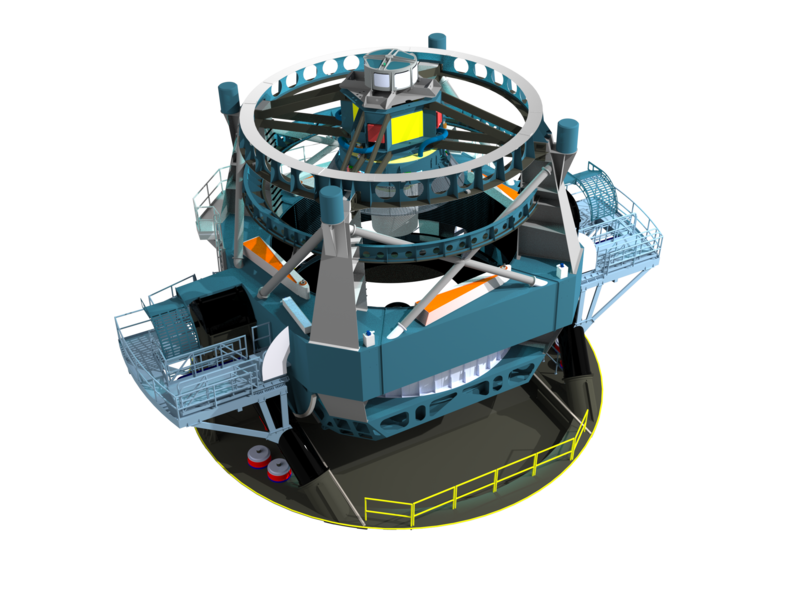 Super detailed, high resolution cut-away render of the facility model showing the inner workings. 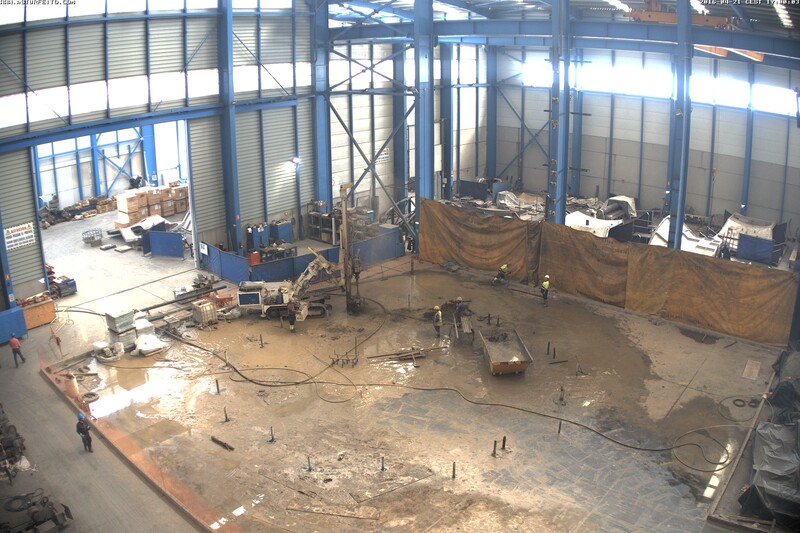 Zoom in on this one; it's worth a closer look. The inside of the dome and the night sky provide a backdrop for this artist's conception of a close-up view of the telescope. 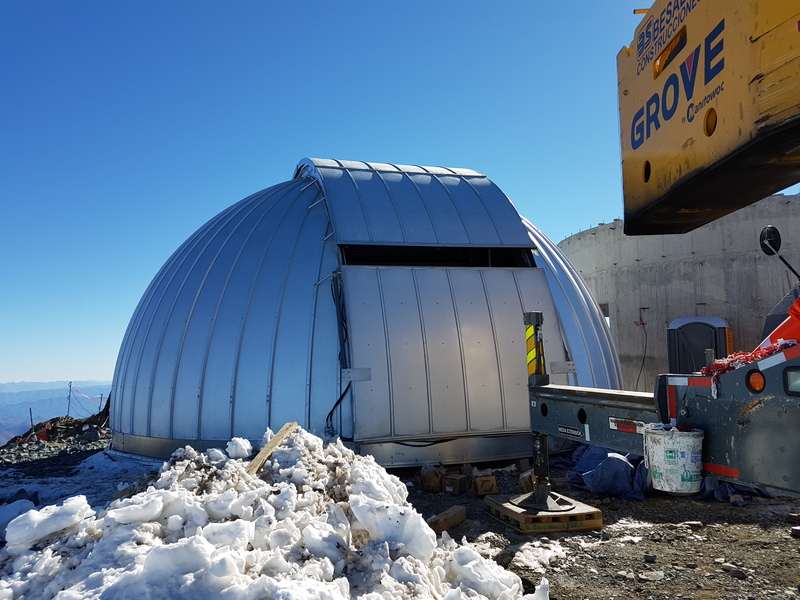 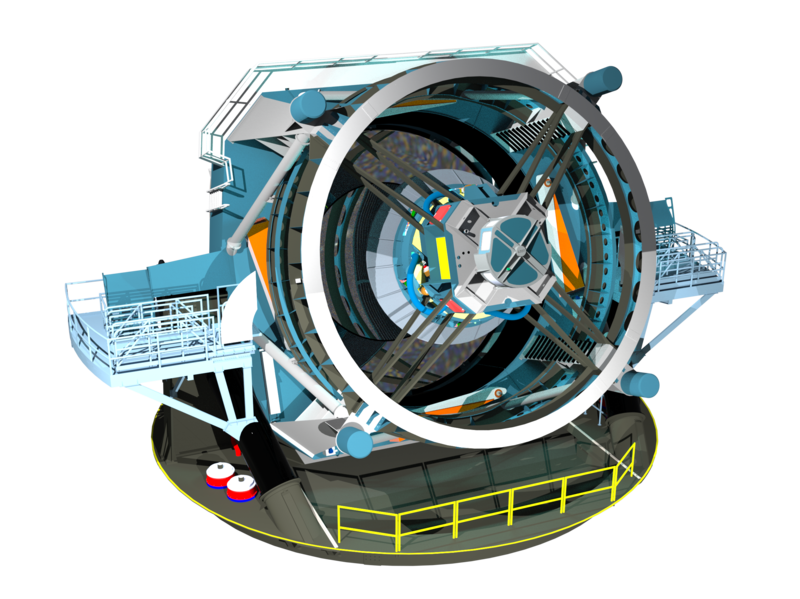 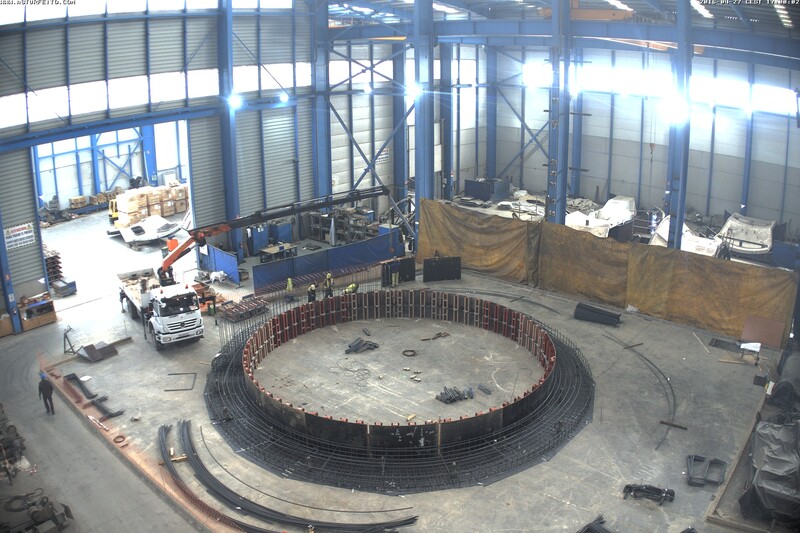 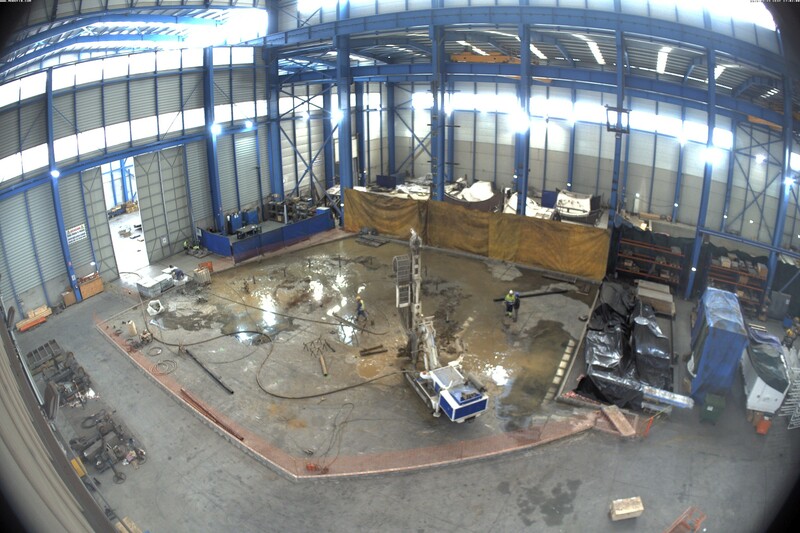 The LSST will carry out a deep, ten-year imaging survey in six broad optical bands over the main survey area of 18,000 square degrees. A three dimensional rendering of the baseline design of the dome with a cutaway to show the telescope within. 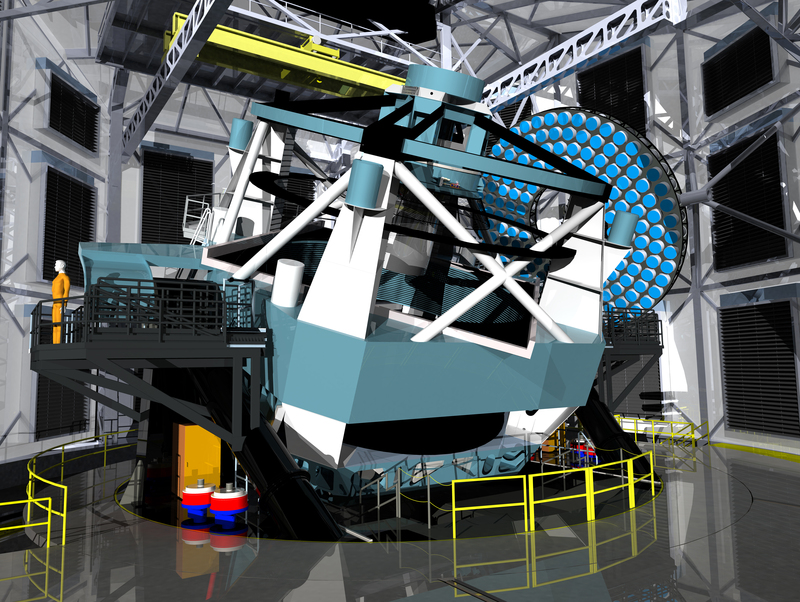 A three dimensional rendering of the baseline design for the LSST with the telescope pointed towards zenith. A three dimensional rendering of the baseline design for the LSST with the telescope pointed at about 45 degrees of elevation. 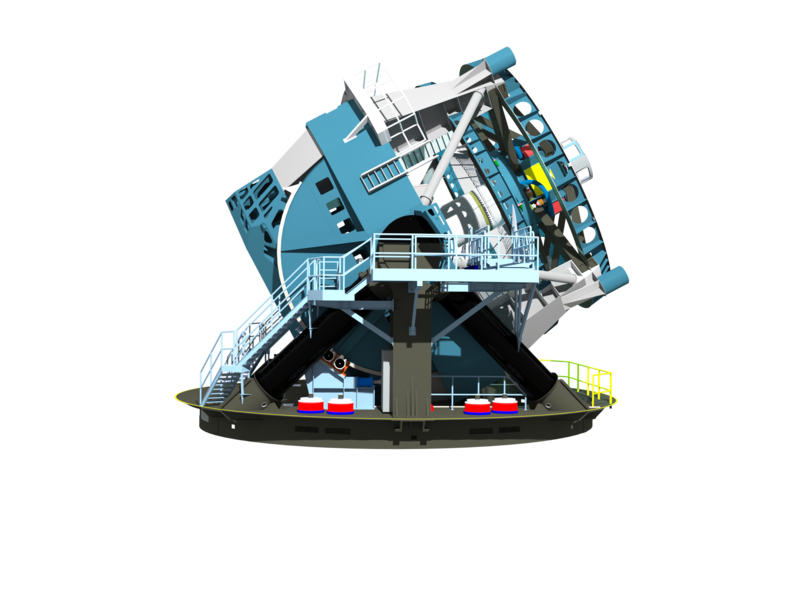 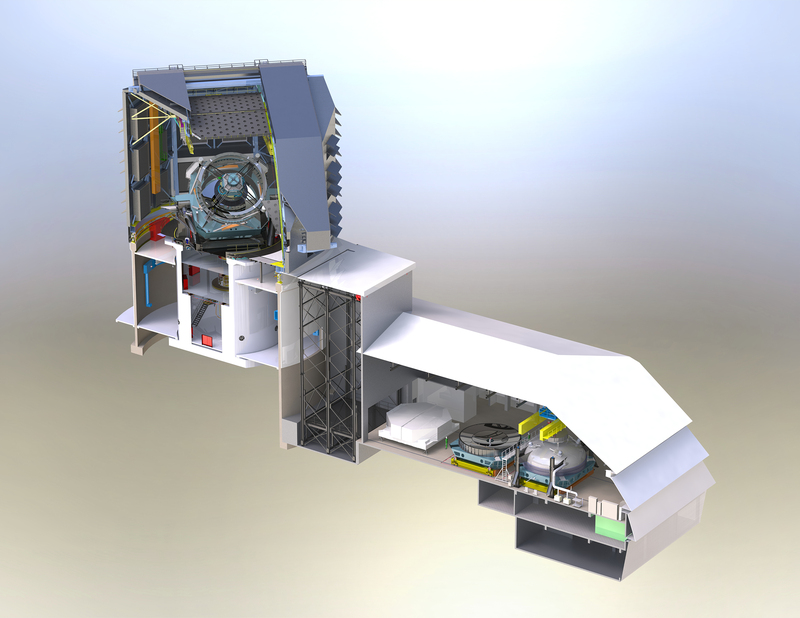 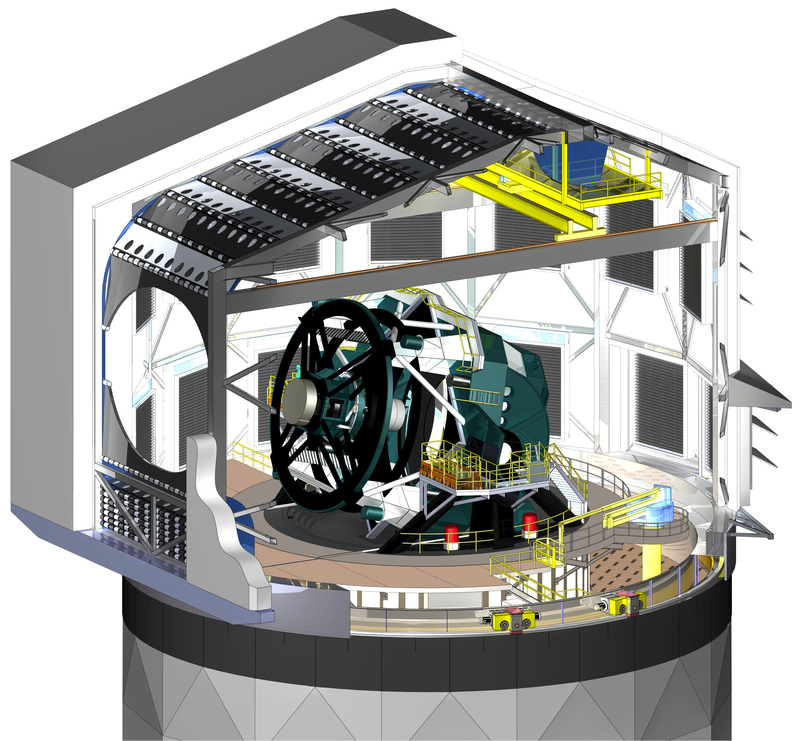 A three dimensional rendering of the baseline design for the LSST in a side view with the telescope pointed at about 45 degrees of elevation. 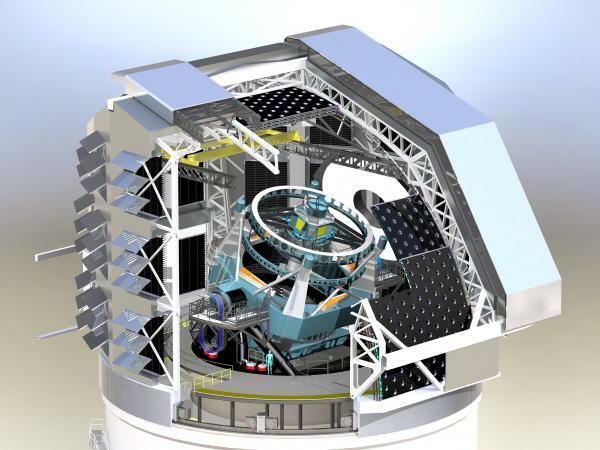 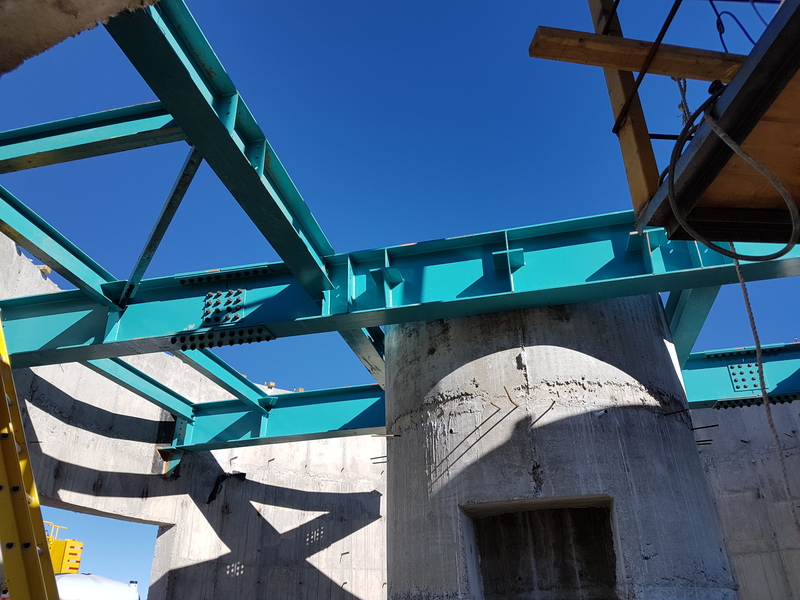 The 8.4-meter LSST will use a special three-mirror design, creating an exceptionally wide field of view, and will have the ability to survey the entire sky in only three nights. 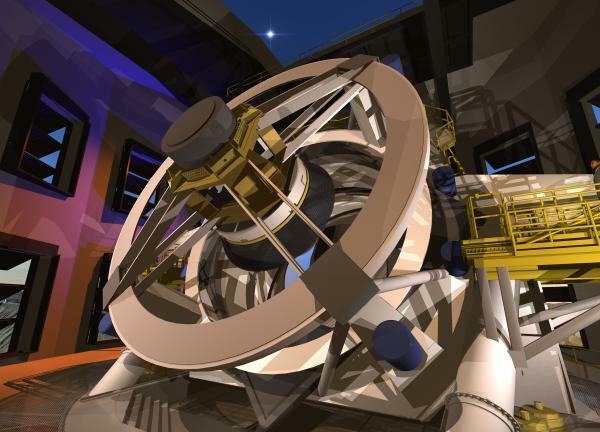 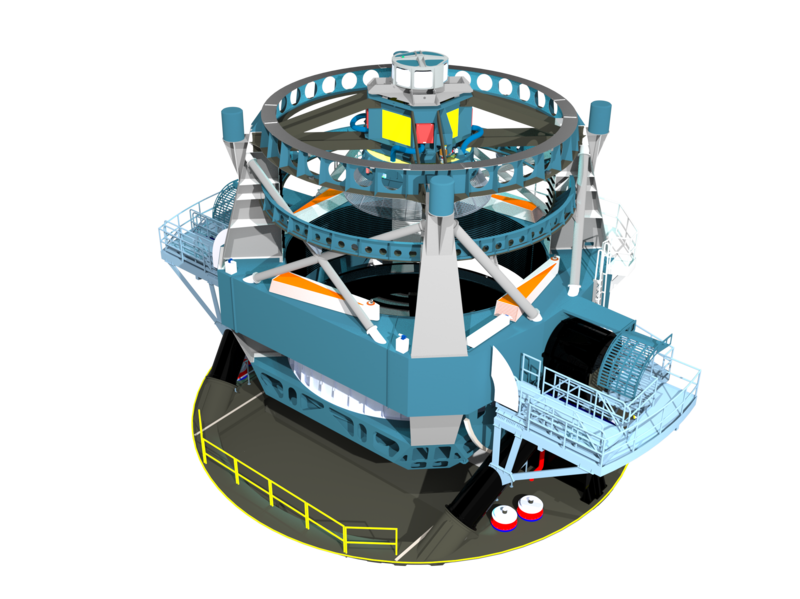 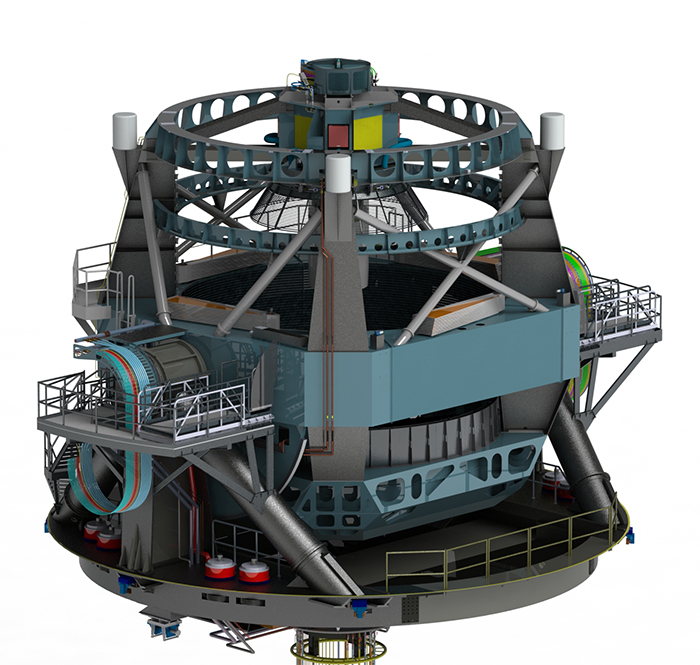 A three dimensional rendering of the baseline design for the LSST with the telescope pointed at an elevation of about 45 degrees. 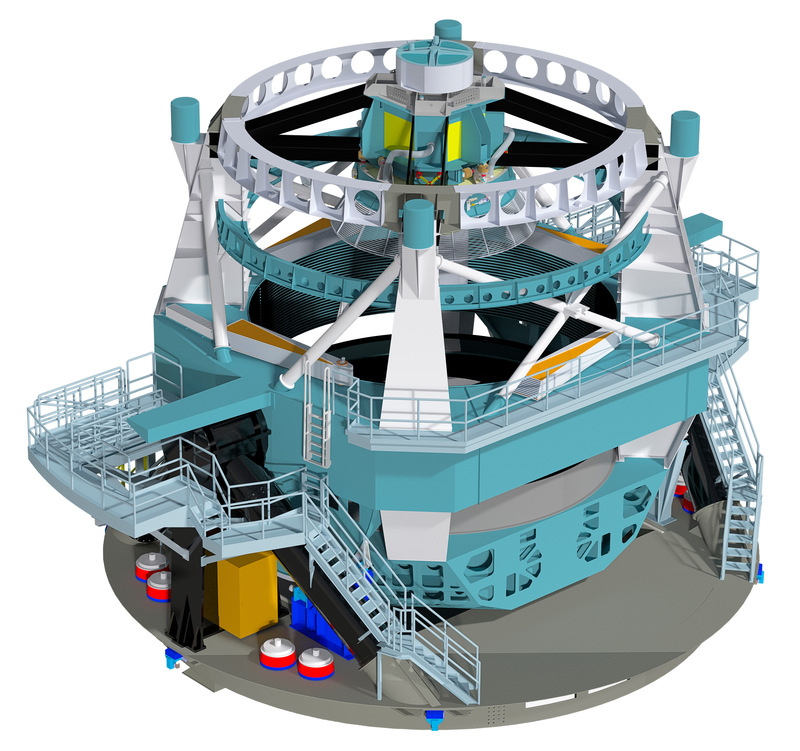 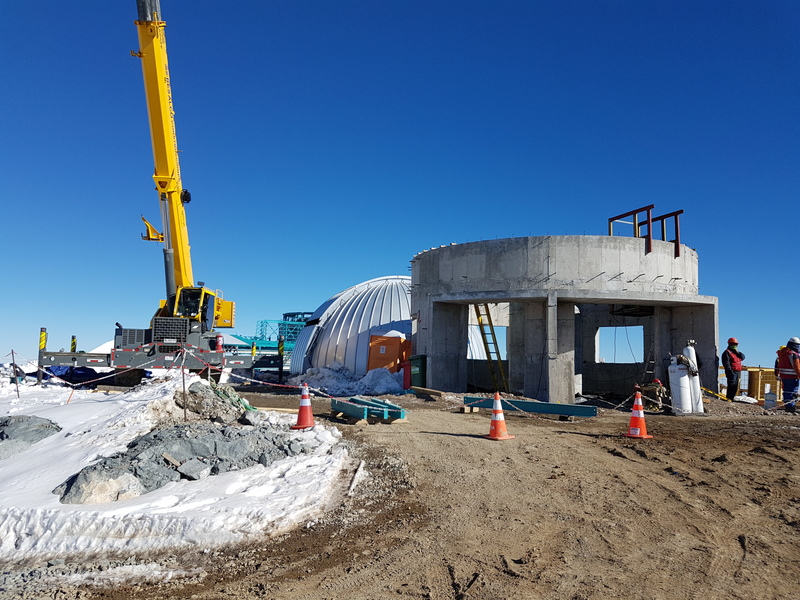 A three dimensional rendering of the baseline design for the LSST as viewed from within the dome.